during the NASCAR NMPA Myers Brothers Awards at the Wynn Las Vegas on November 28, 2018 in Las Vegas, Nevada. 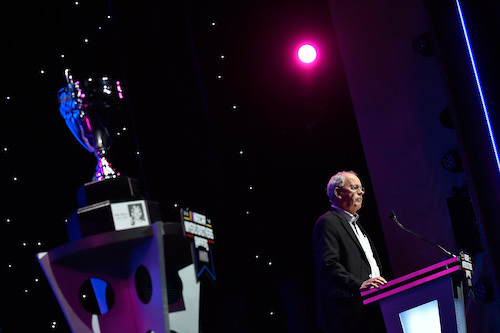 Yearly NASCAR award distribution in Las Vegas began Wednesday with the Myers Brothers Awards program. The big award of the program, the Myers Brothers Award, went to NASCAR Chairman and CEO Jim France. The Myers Brothers Award has been presented yearly since 1958 to recognize individuals who have made significant contributions to stock car racing. It is named after racing brothers Billy and Bobby Myers, and the yearly recipient of the award is selected by a vote by National Motorsports Press Association membership. France became NASCAR Chairman and CEO in August, after the arrest of nephew Brian France for DWI and drug possession. Previously, Jim France was an advisor to Brian France, in addition to administrative duties within NASCAR, International Speedway Corporation and IMSA. Jim France has been involved in NASCAR in some capacity for nearly 60 years, beginning in race ticket, program and concession sales as a 14 year old in 1959. Several other awards also were presented during the Wednesday award program. New Monster Energy NASCAR Cup Series champion Joey Logano was recognized with the presentation of the Goodyear Tire and Rubber Company Award and Sunoco Diamond Performance Award. Also, his sponsor, Shell Pennzoil, was recognized with the Champion Sponsor Award and his crew chief, Todd Gordon, with the Champion Crew Chief Award. Mobil 1 Driver of the Year Award — Ricky Stenhouse Jr.